In this article you will find 15 supportive behavior strategies for children on the autism spectrum (some strategies can be used with adults as well). Many of the strategies can also be used to help children without autism who have challenging behaviors. When caring for or working with a child with autism, a parent, teacher, or other adult may become frustrated with the child’s behavior. Behaviors can come on suddenly, last for hours, be hard to control, or make the adult scared or embarrassed. Side-Note: *Autism is considered to be on a spectrum. It is called a spectrum because some people have only a few or mild symptoms while others have many or severe symptoms. Here are some common characteristics of children with autism to help you better understand the root of their behavior. Some of the characteristics below can also be common in very young children, or individuals with developmental or emotional disabilities. Keep in mind that all children with autism are different. Some may have only a few of the characteristics below, while others may have many. Side-Note: *All children have exceptional strengths as well. It is extremely important to focus on these strengths, let the child know how proud you are of his efforts, and incorporate strengths into play and learning. trouble using and understanding language or certain aspects of language such as sarcasm, expressions, and body language. difficulty taking in sensory input in an ordinary way. For example, a vacuum cleaner may sound overly loud, a smell may be extra strong, or the feel of something may be extra itchy. a need for a particular routine so they know what to expect as they can become frustrated when things don’t go the way they had expected. trouble recognizing another person’s opinion or understanding another person’s feelings. difficulty switching from one activity to another, especially if they have to switch from something enjoyable to something not enjoyable (I think everyone can relate to that). difficulty organizing themselves in productive play when not directed or given specific instructions. Sometimes these characteristics lead to problem behaviors at home, in the classroom, or in the community which can be frustrating for the child and the adults caring for him. (Note: the strategies below illustrate ways for the adult to behave in order to promote positive behavior in the child. Adults who work with children with behavior challenges are sometimes surprised to hear that they have to change their own behaviors or change the environment to meet the needs of the child. As a behavior consultant, I have often heard “Why should I have to change? He is the one acting out.”, “It is too much work to make these changes.” “Why should he be rewarded for doing what he is supposed to do?” In actuality, the adult does not have to make any changes in their own behavior or the environment, but then the child’s behavior will not change. As far as rewards go, it is always beneficial to acknowledge and praise children for positive behavior and to let children earn privileges rather than taking privileges away). *Keep in mind that there is no magic answer. All you can do is try your best. If you are putting sincere effort into implementing effective strategies and trying your best to meet the needs of your child/student, you are doing the right thing, even if you are not getting the results you hoped for. Additionally, children who do not appear to understand language may not respond to some of the strategies in this article, but some suggestions for children with severe language difficulties are also included. If you feel like the situation with your child is unmanageable, seek help from a medical, behavioral or mental health professional. If you work in a school, talk to your team members to get as much support as possible. 1 – Let the child know what will happen next. For example, “After you finish the puzzle, it is time to brush your teeth”, or “In five minutes it is time to turn off the computer and start your writing assignment.” For some children it is helpful to set a timer so the child can keep track of how much time is left. So in the example above “In five minutes it is time to turn off the computer and start your writing assignment” you would set the timer for five minutes. Some children need reminders as the time is winding down to 2 minutes, 1 minute, etc. For children who have trouble understanding the concept of time or numbers, a visual timer can be helpful because the child can see how much time is left. Visual timers can be purchased on Amazon or other online stores. Here are some examples below that you can click on to see prices and reviews. With a red clock visual timer, children can see time running out as the red disappears. Sand timers let children know that time is up when the sand at the top gets to the bottom. You can even get a free visual timer app on your IPhone, IPAD, or Android device. Just do a search for visual timer in your app store. See 3 Ways to Use Timers to Encourage Homework and Chore Completion for more information on how to implement timers for children with and without autism. You would need to get the paper laminated and purchase Velcro to make this kind of chart (there are instructions at the bottom of this article for how to do this). Side Note: *Children who have difficulty understanding language may respond better to pictures telling them what is expected, rather than verbal directions. 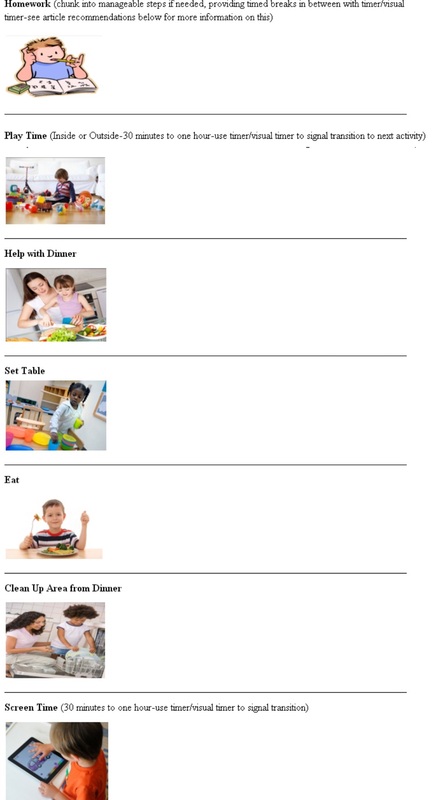 For example, if you want the child to work on math and then have a play activity, you can show them a “first/then” board rather than saying “First we will do math and then play a fun game.” See an example of a “first/then” board below (you can find instructions for how to make this at the bottom of the article). Just like the timers, you can also find IPAD, IPhone, and Android First/Then Apps. These apps have libraries of real photos to create first /then boards right on the screen. Check out the First Then Visual Schedule HD by Good Karma Applications, for IPAD/IPhone for an example. For example, if you tell your child that you will play a game with him if he plays quietly while you talk on the phone for five minutes, make sure that you keep your end of the bargain (barring unforeseen circumstances).You may need to give him a choice of what activity to do during that time that you are on the phone. If your child can’t tell time, set a timer that your child can see, get off the phone in exactly 5 minutes (barring unforeseen consequences), and play the game. If you do this consistently, your child will come to know what is expected and will believe in what you say. As he improves, you can increase the time. Once he learns how to play independently while you talk on the phone, you may be able to fade back on such a rigid set-up, but it is a good starting point to teach him how to act while you talk on the phone. This is one example but can be applied to many scenarios. If you don’t implement expectations with consistency and follow through on your words, your child will not know what to expect. This can lead to anxiety and challenging behavior (e.g., talking to you while you are on the phone, repeatedly asking when you will be off the phone, etc.). Children with autism or other challenging behaviors thrive on predictability, so do your best to make their world predictable. Another example of predictability would be having a set routine each night (e.g. first homework…then TV or first put pajamas on…then read a story). Keep in mind that difficult behaviors are more likely to come out when things aren’t predictable, and we know we can’t make everything predictable all the time. Just know that if you are doing your best, it is not yours or your child’s fault when things don’t go according to plan. Just get back in the swing of a predictable routine as soon as possible. For instance, if your child is using a loud voice in the movie theater and you say, “whisper in the theater,” praise the child with a comment such as “nice job whispering”, or “thank you for being respectful in the theater.” For children who understand language well, situations like this are a good time to teach about other people’s perspectives (e.g., “Thank you for whispering. This let’s other people hear the movie.”). For instance, if your child often has a tantrum in a store when he can’t go to the toy aisle, tell him exactly what you expect of him before you go to the store and reward him with a privilege for following that expectation. For instance, you can say something like “We are going to Target. We are going to the school supply aisle to buy paper and pens, and then we will pay and go home.” Once in the store you can give reminders (e.g., now we are going to get the paper and pens, now we will go pay, you’re doing a nice job following the rules, now we are going home, etc.). Let the child know that he can earn a privilege for following the rules. Privilege ideas include getting a sticker of a favorite character, playing a favorite game once at home, watching a favorite show, going on the computer, staying up ten minutes past bed time, etc. Try to think of a privilege that your child might like or ask him what he would like to work towards. When the child earns the privilege, praise him with specific language. In the example above you could say, “You followed the rules at the Target. We got the paper and pens, paid, and came home. Nice work! Now you can enjoy some computer time.” Make sure the privilege is something the child wants. You can let the child choose what he would like to work for ahead of time. 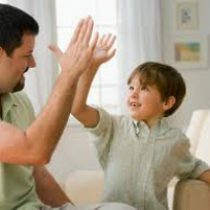 Children also benefit from nonverbal praise such as high fives, smiles, thumbs up, etc. For example, if the child is on the computer and you want him to come work on a puzzle, show him the puzzle so he knows what it is you want him to come do. See How to Use Schedules to Improve Children’s Behavior for more on getting the materials for and utilizing “first/then boards” and visual schedules. 8 – Allow the child to bring a transitional object from one activity to the next. For instance, if the child has to leave the classroom to go with a new staff member such as a speech therapist, let him bring a favorite object from the classroom such as a stress ball or toy car. This can assist with helping him feel more comfortable in the unfamiliar surroundings. For example, if the child is running in the store, remind him or show him how to walk nicely. If necessary, find something interesting to show him and call his attention to it, rather than focusing on the problematic behavior. If he is running in the hall at school, redirect him back to the line, with a short directive such as, “Come back to your spot in line” or remind him to “walk in the hallway.” For children with trouble understanding language, try demonstrating what is expected or use a gesture, rather than just giving the verbal direction. 10 – If the child seems over stimulated from sensory input, such as in a large crowd, bring him to a quieter place to de-stress. Be mindful of situations where your child might feel overwhelmed before you take him there (e.g., a fireworks show, a crowded festival, etc.). There are also strategies to create an environment that helps a child with autism feel less overwhelmed by sensory input. See How to Set Up the Classroom for Children with Autism and ADHD which includes strategies that can be used at home as well. 11 – Make directions clear, short, and concrete. For example, if your child is throwing food at the table say, “eat your food” rather than “Be good at the table,” “Don’t throw your food” or “Would you stop with that! You are always throwing your food.” For children with difficulty understanding language, showing them a picture or a visual demonstration of the behavior you want to see, can be helpful. 12 – Take advantage of teachable moments. For example, If the child snatches a toy from another child, teach him how to use his words to ask for they toy (if he has the language capabilities to do so) rather than reprimanding him for snatching the toy. 13 – When giving tasks, assignments, chores, etc. many children do better if they know when the task will end. Please cut out each word and match it to the correct picture. Related Article: Many of My Students on the Autism Spectrum Would Not Participate Until I tried These Hands On/Interactive Tasks. Additionally, when the task has a clear visual ending, it eliminates the need for a timer. For instance, if the child is working on a 10 piece puzzle you can let him know what comes next (after you finish the puzzle, it is time for dinner) and no timer would be needed. This concept can be applied to anything with a clear visual ending (e.g., after you finish the ten math problems, you can go on the computer). Whether you are using a timer or giving an activity with a clear visual ending, give a break in between for the child to do something enjoyable if he gets overwhelmed or frustrated with lengthy tasks. For example, if the child is supposed to write 20 sentences for homework, let him write ten, take a 10 minute break to do a preferred activity, and then do the next ten. (set a timer or use another method to clearly indicate when the break is coming to an end, such as a countdown chart or a short task with a clear ending). Many children I have worked with or have observed, did very well (sat nicely, worked diligently, etc.) when given a hands-on/visual activity. Examples include playing a computer game, sorting objects by color or object type (for example, putting the silverware away from the dishwasher, sorting laundry by light and dark, putting materials away in the correct boxes, etc.) completing a puzzle, constructing a model car, tracing or coloring in a picture, etc. As another example, some teachers of children with autism teach academic skills through sorting tasks. For instance, an activity about learning colors would require the child to put all the yellow chips in a yellow cup, all the blue chips in a blue cup, etc. Keeping a child focused with an activity they do well at is a great way to encourage calm behavior. However, if the child is feeling overwhelmed or frustrated from the activity, allow a break or a change in the task. 15 – Stay calm when interacting with the child (I know it can be hard at times but make every effort to be as calm as possible). If you are regularly having trouble staying calm, you may benefit from talking to a friend, family member, or therapist for support. Do not take it out on your child. Yelling and threatening will not make behavior better. It may stop the behavior in the short-term, but the behaviors will occur again. You may actually make the behaviors worse because the child may start to feel anxious, scared, angry, embarrassed, or sad. Children with autism are not choosing to act in a way that is frustrating to you or anyone else. They legitimately need positive support from you to help them meet their emotional/behavioral needs. Finally, it is important to recognize that some children on the autism spectrum have trouble generalizing expectations across situations, so the same strategies may need to be used in situations that are similar to one another. Keep in Mind: If you are using these strategies for the first time, you may not see change as quickly as you ‘d like. Your child/student will not be used to your new techniques and may even push harder due to the sudden change in your behavior. I know it is hard but be patient and keep implementing these strategies with consistency. Option 1: Create pictures and schedules on an IPAD App such as Choiceworks and either use them right on the tablet, or print them out and laminate them. You can get laminating done at Staples or purchase your own laminator and laminating patches, such as the Scotch Thermal Laminator Combo Pack shown below. If you work in a school, they may already have a laminator for you to use. If you are a parent, you can also try asking your child’s school if they can help you laminate some pictures for an at home schedule. Option 2: Search Google Images for the pictures you want to use, print them out, and laminate them. Option 3: Purchase ready made laminated pictures such as the Home and School Responsibility Checklist Set or the All-in-One Kit for Autism Communication, with 160 large color photos. Option 4: Use computer software to create and print out pictures such as Visual Essentials Photo and Template Collection (although some raters have complained that it needs updating and is not as good as Boardmaker , it is much more affordable). There are 3,000 photos, templates and layouts and photo schedules that are pre-made for everyday routines related to chores, hygiene, and more (again, print them out and laminate them). Option 5: Take pictures of your own child involved in the activity that you want a picture for. Develop or print out the pictures and laminate them. What did I miss? Please add your own effective strategies below. Do you want to enhance your knowledge and career opportunities in the field of autism? Become a certified autism specialist. You will receive 20% off your Autism Certification with the partner code educationandbehavior at www.ibcces.org. Sign up here to get monthly updates from IBCCES right in your inbox. Learn techniques for helping those with autism, hear from experts, & stay on top of latest research developments. BCBA vs CAS: What’s the Difference? © 2017 International Board of Credentialing and Continuing Education Standards. All rights reserved.